Yep were back camping, how did we know we woke to rain, seriously this getting ridiculous now. We just spent what 5 days in a h ouse not a bl**dy drop, one night in the tent and its raining again arghhhhhh. 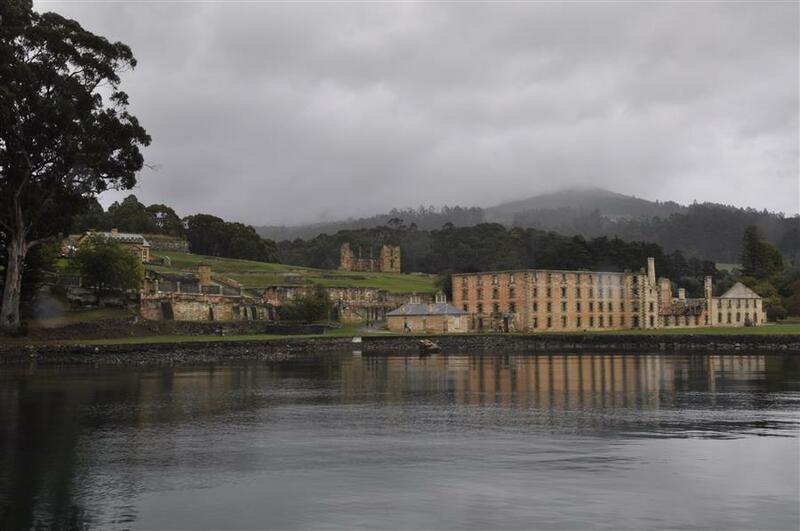 So we slept in hoping it as a bad dream but alas no, so we got up and headed to Port Arthur penal colony – sounds so wonderful doesn’t it and the bleak dreary skies really sparked you up eight – no not really but what could we do. Hmm what could we do …. walk, walk some more and then just to be sure we walked some more. 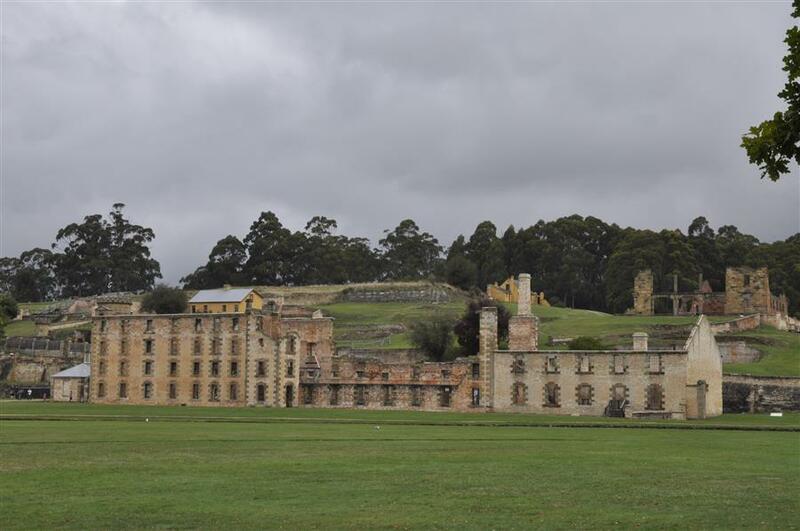 Apparently there are about 100 acres/hectares I dunno which one he said but its flamin big and we walked it, well OK. Of the whole 100 whatever’s but all the main site, approximately 30 convict period buildings in all. We went on the cruise that goes around Isle of the Dead – yep the day really cheered up with that one, and we did the guided tour, which I must say was very interesting and the guides are all very knowledgeable and interactive which is always good. Given that this place was a place of punishment, known as one of the hardest, yet also one of the most modern and more pleasant – how the two of them go together is beyond me , but anyway I really have to hand it to these convicts they were darn good at building things, despite 100+ years, water, salt, fire, auctions and vandalism those buildings are still there almost like a screw you to the establishment that put them there .. ha we are still you where are you! 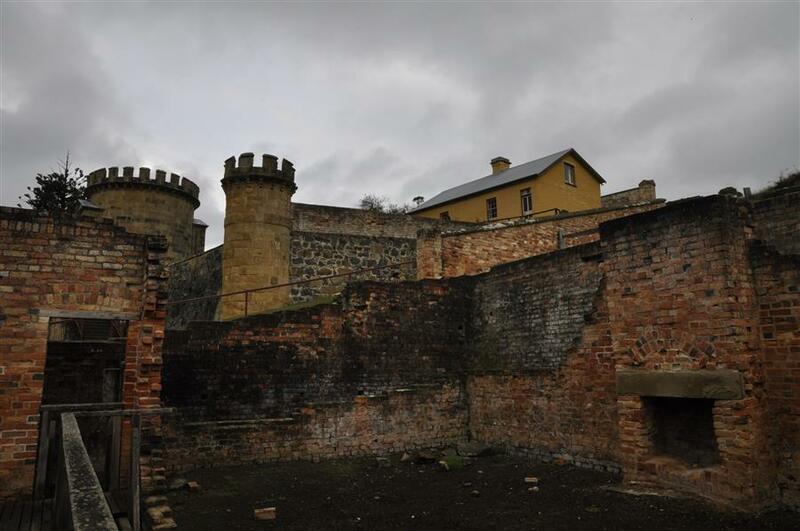 They were also very ingenious or the military engineers whoever it might have been, the water diversions and sandstone gutters and drains are all very amazing and other than being sandstone would not look out of place in the most modern of constructions. The gardens are also very nice and through the verge patches, the fruit trees and the variety of flowering plants its easy to see the international backgrounds of the original and early settlers, and most still flowering and bearing fruit to thi s day, obviously with help now from the trust but still a mighty fine effort. So after about, I kid you not, 5-6 hours of wandering and we weren’t really slow poking it too much, with feet aching to be put up we headed back to camp to do some washing and have a lazy arvo and given the weather there wasn’t going to be a sunset to chase today.